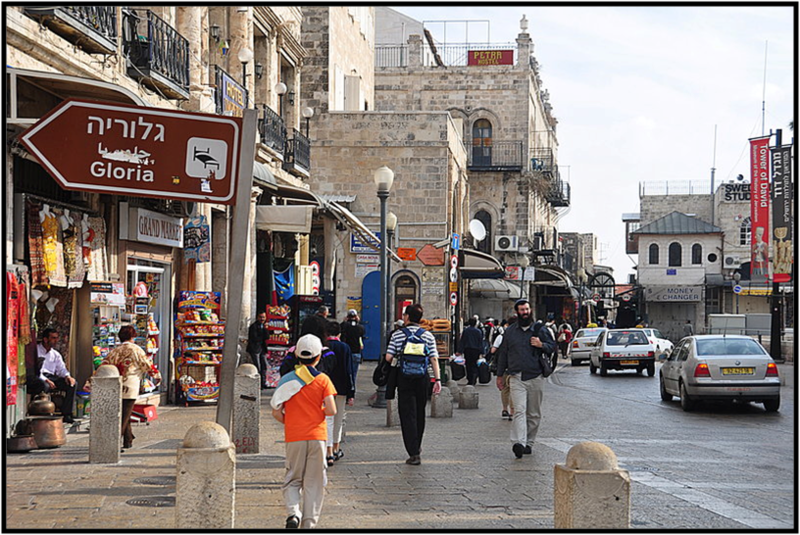 The sign in this photo displays the name of the Hotel Gloria in Hebrew, Arabic, and English, and is an example of the history and politics of language in the region. In a 2002 court case, the Supreme Court declared it constitutionally mandatory for municipalities with a significant Arab population to have multi-language signs. In 2009, however, the Transport Minister introduced exclusively Hebraicized road signs in Israel. The Arab population sees this as an affront to their cultural heritage. The politics of language took a turn for the worse in 2009 when ultranationalists painted over Arabic lettering on street signs throughout Jerusalem, an effort resisted by Israeli moderates. The Hebrew language has long been a prominent feature of Israeli history and identity. Hebrew fell out of common usage during the Diaspora, the centuries-long period after the Roman destruction of Jerusalem when the Jewish people were displaced and without a homeland. Instead people adopted local languages of Europe and other regions where they settled or developed hybrid languages such as Yiddish. With the creation of the modern state of Israel, Hebrew became a unifying cultural trait and its popularity as a common language grew quickly. In one of the first official actions taken to secure the state, The Palestine Order in Council of 1922 established Hebrew and Arabic as its official languages. The inclusion of two languages was an attempt to keep Israel from imposing its cultural identity on all of Palestine and its residents, who were in large part Arab. The Health Insurance Law of 1994 gives Israeli citizens government funding for an unlimited number of in-vitro fertilization (IVF) cycles until the live birth of two children. Since IVF was introduced to the country in 1981, the popularity of the process have grown substantially, to the point that Israeli women undergo more IVF cycles than women in any other country in the world. These reproductive policies also provide fertility services for single and married women until at least the age of 45 and support imports of fertilized eggs from abroad. Encouragement of reproduction and childbearing has its roots in the country’s history, including the desire to preserve the Jewish population after the devastating effects of the Holocaust. Government support for reproduction is also grounded in religious rules, including the biblical command to “be fruitful and multiply.” These policies are not without risks, however. Many women who undergo multiple IVF cycles are unaware of the health risks associated with the procedure. They also tend to ignore other methods of overcoming infertility, like adoption, and are often overconfident in the likelihood of conception. Daphna Birenbaum-Carmeli (2004) “Cheaper Than a Newcomer”: On the Social Production of IVF Policy in Israel, Sociology of Health & Illness 26 (7): 897–924; Daphna Birenbaum-Carmeli and Martha Dirnfeld (2008) In Vitro Fertilisation Policy in Israel and Women’s Perspectives: The More the Better? Reproductive Health Matters 16 (31): 182–191; and Daniel Sperling (2010) Commanding the “Be Fruitful and Multiply” Directive: Reproductive Ethics, Law, and Policy in Israel, Cambridge Quarterly of Healthcare Ethics 19 (3): 363–71. Under the Beverage Container Deposit Law of 2001, an extra charge is added to many cans and bottles and is refunded to those who return the containers for recycling. The law was created despite considerable opposition from beverage producers, represented by the Manufacturers Association of Israel. Once they realized that they would not prevail, however, they worked in collaboration with the government. The law places the recycling responsibility on producers and manufacturers of containers, known as “extended producer responsibility,” so that the task of reducing solid waste is not simply left to the government. However, the outcome has veered from the original intent. A nonprofit recycling organization called the ELA takes responsibility for collecting beverage containers, regardless of the producer, and handles the refunds for retail stores and consumers. As a result, manufacturers have been allowed to distance themselves from any responsibility for recycling. Tamer Barkay (2009) Regulation and Voluntarism: A Case Study of Governance in the Making, Regulation and Governance 3: 360–75; Doron Lavee (2009) A Cost-benefit Analysis of a Deposit-refund Program for Beverage Containers in Israel, Waste Management 30: 338–45; and Eyal Artzi, Environmentally Sound Management of Solid Waste, Israel Union for Environmental Defense, Tel Aviv, 2002. Israel forestry policy promotes afforestation – the planting of trees on land that was not previously considered forest – and works to conserve existing forested lands. In 1995, over 600 square miles of forest were protected under these rules. Since 1960 the Jewish National Fund, a non-governmental organization, has assumed tree-planting responsibilities in the country, where 10 percent of the land area is considered forest. The organization’s influence began much earlier. In the 19th and early 20th century, the forests were over-cut, over-grazed, and burned. The Jewish National Fund began restoring vegetation in the region but soon discovered that olive trees often did not flourish, and so in 1917 the agricultural approach was revised to emphasize forestry. When Israel gained independence in 1948, forest governance was shared between the governmental Afforestation Department and the Jewish National Fund until 1960, when the Jewish National Fund gained all responsibility. Overall, the afforestation policy has turned an arid region into one with significant plant cover. Researchers are now studying the potential for further forest expansion as a mechanism for combatting global warming by pulling carbon from the atmosphere. Because Israel is classified as a developing country under the Kyoto Protocol treaty, it is eligible to receive payments for reducing atmospheric carbon. Thus far the idea has had a cool reception in the country due to concerns about administrative costs and the ethics of allowing polluters to pay others to mitigate their environmental impacts. Shaul Amir and Orly Rechtman (2006) The Development of Forest Policy in Israel in the 20th Century: Implications for the Future, Forest Policy and Economics 8 (1): 35-51; Henri Rueff et al. (2008) Dryland Afforestation and Poverty Alleviation: Bedouin and Palestinian Non-timber Forest Product Collectors in Contrasting Economic Environments, Human Ecology 36 (6): 923–30; and Alon Tal and Jessica Gordon (2010) Carbon Cautious: Israel’s Afforestation Experience and Approach to Sequestration, Small-Scale Forestry 9 (4): 409-28. Since 1982, all major development projects in Israel have been evaluated based on environmental impact statements. Written by a planning commission and an environmental advisor, environmental assessments are incorporated into the planning process at the national level through the National Planning Building Board, and in regional and local planning and building commissions, in order to minimize the cumulative negative impacts of all building projects. Valerie Brachya (1993) Environmental Assessment in Land Use Planning in Israel, Landscape and Urban Planning 23(3-4): 167–81; and Shaul Amir and Yehudit Mosseri (1997) Evaluation of Performance of EIS Regulations: An Empirical Investigation of Israel’s Program, Impact Assessment 15(2): 127–58. Air pollution from diesel-powered vehicles poses a major health hazard in Israel. To address this problem, in 2006 Israel adopted “Euro 4,” a series of regulations used in the European Union for passenger vehicles and light-duty diesel engines. This demonstrates the influence that social rules developed in Europe are having in a wide range of countries today. Diesel-powered vehicles are responsible for about 80 percent of the total nitrogenous oxide pollution in the Israeli atmosphere. There are 330 vehicles for every 1000 residents, and road density has increased because the rate of motorization far outweighs the rate of road development. Following Euro 4, most Israeli car engines reduce particulate matter at the moment of combustion by using a catalytic converter together with a urea-based solution that transforms nitrogen oxides into nitrogen and water. More stringent air pollution tests have also been put in place to regulate carbon monoxide emissions. Euro 4 compliance has led to fuel quality improvements and has been accompanied by new government policies and public awareness campaigns. The new policies authorize a Green Police to inspect vehicles and enforce standards, to encourage public transportation, and to provide tax incentives for fuel-efficient vehicles. Together these initiatives, stemming from Euro 4 compliance, give Israel the chance to breathe easier. Gregory Newmark (2001) Emissions Inventory Analysis of Mobile Source Air Pollution in Tel Aviv, Transportation Research Record: Journal of the Transportation Research Board 1750 (1):40–48; and S. Gabbay (ed. ), The Environment in Israel – 5th Edition (National Report submitted to the UN Conference on Environment and Development), Chapters 3-4, Ministry of Environment. Jerusalem, 1992. With its predominantly desert climate, the natural availability of water per person in Israel is less than half of what is internationally recognized as the minimum level below which countries experience water stress. To address this problem, the Water Law of 1959 began a decades-long process of developing water delivery systems. The most significant outcome of this system of rules is the National Water Carrier, created to extract water from the Sea of Galilee. The Water Law has been extremely successful in achieving its goals, and the low price of drinking water in Israel does not reflect freshwater scarcity within the country. However, this extraction has produced serious environmental problems. Gila Menahem (1998) Policy Paradigms, Policy Networks and Water Policy in Israel, Journal of Public Policy 18 (3):283–310; Alon Tal (2006) Seeking Sustainability: Israel’s Evolving Water Management Strategy, Science 313(5790): 1081–84; Eran Friedler (2000) Water Reuse – An Integral Part of Water Resources Management: Israel as a Case Study, Water Policy (3): 29–39; Asher Brenner (2006) Removal of Nitrogen and Phosphorus Compounds in Biological Treatment of Municipal Wastewater in Israel, Israel Journal of Chemistry 46(1): 45–51; Y. Arkin and A. Gilat (2000) Dead Sea Sinkholes–An Ever-developing Hazard, Environmental Geology 39(7): 711–22; and Robert Booth, Race is On to Save the Dead Sea, The Sunday Times (London), September 3, 2006. Israel allocates over 50 percent of its scarce water to the agricultural sector and subsidizes water costs for farmers, even though agriculture comprises only two percent of the national economy. This allocation system has created artificial demand for water in agriculture and has further intensified water scarcity. The environmental repercussions have been substantial, as groundwater reservoirs are quickly diminishing. The rules governing water allocation stem from both economic and political considerations. According to a comprehensive review by Kislev, because “water is not an economically important item in the budget of households or in the cost of manufacturing, the farmers do not face strong opposition and they have succeeded in tilting policy in their favor.” The author argues that today’s rules stem in part from the political influence of employees of the national water company, Mekorot, which benefits from current pricing structures. The rules governing wastewater counteract, at least to some degree, the wasteful effect of Israel’s water pricing and allocation policies. Israel recycles about three-fourths of its wastewater. (By comparison, the United States only recycles two percent.) Wastewater must conform to rules governing acceptable levels of chemical oxygen demand, total suspended solids, salinity, micro-organic pollutants, trace elements, pathogenic microorganisms, and nutrients. These rules were updated in 2010 with the Public Health Regulation-Effluent Quality Standards and Rules for Sewage Treatment. Gila Menahem (1998) Policy Paradigms, Policy Networks and Water Policy in Israel, Journal of Public Policy 18 (3):283–310; Alon Tal (2006) Seeking Sustainability: Israel’s Evolving Water Management Strategy, Science 313(5790): 1081–84; Asher Brenner (2006) Removal of Nitrogen and Phosphorus Compounds in Biological Treatment of Municipal Wastewater in Israel, Israel Journal of Chemistry 46(1): 45–51; Yaov Kislev, The Water Economy of Israel, Taub Center for Social Policy Studies in Israel, Policy Paper No. 2011.15, Jerusalem, 2011; Eran Friedler (2000) Water Reuse – An Integral Part of Water Resources Management: Israel as a Case Study, Water Policy (3): 29–39; and Nava Haruvy (1997) Agriculture Reuse of Wastewater: Nation-wide Cost-benefit Analysis, Agriculture, Ecosystems and Environment 66 (2): 113–19. Water has long been a source of political conflict in Israel. Around 700 BCE, King Hezekiah ordered the construction of the 1,500-foot Siloam Tunnel (which remains intact today) to protect Jerusalem’s water source, the Gihon Spring, from the invading Assyrians. When modern states were first created after the breakup of the Ottoman Empire, they scrambled for water rights. Today Israel shares most of its natural water resources with neighboring Syria, Jordan, and the Palestinian-occupied territory of the West Bank. With all of these nations suffering from water scarcity, water allocations have been one of the largest transboundary disputes in this region, particularly between Israel and Palestine. The Mountain Aquifer is a system of groundwater reservoirs dispersed throughout Israel and Palestine, and the majority of this groundwater originates within the West Bank. During the 1967 war, the Israeli military imposed quantitative limits on water extraction allowed by Palestinians. Water allocation remains a contentious issue of dispute in long-stalled efforts to achieve peace in the Middle East. Brooks and Trottier argue that in addition to the inequitable distribution of water, quantitative allocation rules are part of the problem, given that water is a regional resource connecting diverse users. They observe that “as water moves, it comes to be used within different polities, each with its own structure of power determining the rules of management. It may be used a first time within a Palestinian farmer-operated irrigation system based on a communal property regime before it returns to the aquifer, laden with some pesticide. It may then reappear in a well operated by the Palestinian Authority to supply drinking water to an urban network. Then it may return to the aquifer laden with bacterial contaminants and reappear in an Israeli well operated by Mekorot [the Israeli water company] to supply drinking water to either an Israeli or a Palestinian municipality.” In other words, solutions to regional water scarcity will ultimately require regional cooperation. David Brooks and Julie Trottier (2010) Confronting Water in an Israeli–Palestinian Peace Agreement, Journal of Hydrology 382(1): 103–14; Yoram Eckstein and Gabriel E. Eckstein (2003) Groundwater Resources and International Law in the Middle East Peace Process, Water International 28 (2):154-61; and Miram R. Lowi (1993) Bridging the Divide: Transboundary Resource Disputes and the Case of West Bank Water, International Security 18(1): 113–38. Under the Dying Patient Act of 2005, if a person is terminally ill—diagnosed as having six months or less to live—the patient can exercise some control over the process. Because of the complexity of end-of-life care, a committee of fifty-nine experts representing many legal, religious, and philosophical views was commissioned to determine the best policy for Israel. The committee decided on a balance between the value of life and the principal of autonomy. A patient’s condition, level of suffering, and final wishes must be taken into account when deciding how to handle end-of-life care. If the patient is deemed mentally competent and wishes to refuse life-sustaining treatments or food or fluids, these wishes will be respected. Active physician-assisted suicide is not permitted under the law. The consultation process is supervised by a senior physician and carefully documented according to guidelines established under the law, which were designed to conform with traditional Jewish law. By removing some of the psychological and emotional pressures on medical professionals through force of law, caregivers are better able to discuss end-of-life care with patients and their families. Still, some medical professionals feel that they do not have the tools to handle the added responsibility. They also are concerned about the complexity of the administrative process established by the law and the added strain it might put on an already beleaguered family. Netta Bentur (2008) The Attitudes of Physicians Toward the New “Dying Patient Act” Enacted in Israel, American Journal of Hospice and Palliative Medicine 25(5): 361–65; Avraham Steinberg and Charles L. Sprung (2007) The Dying Patient Act, 2005: Israeli Innovative Legislation, The Israel Medical Association Journal 9(7):550–52; and Avraham Steinberg and Charles L. Sprung (2006) The Dying Patient: New Israeli Legislation, Intensive Care Medicine 32(8): 1234-37.